I must admit my title for this article sounds scandalous and scammy, like something a Las Vegas-based email spam company would send out. But it’s also completely accurate, because I really can teach you the best way to make money from the stock market all in one short blog post. Some of our readers are already advanced investors.. those few people already know all of this and the article will just be preaching to the choir. But the reason I’m still writing is that almost nobody I meet in day-to-day life knows anything about investing, the stock market, or big publicly-traded companies in general. Their opinions on the subject range throughout boredom, fear, mistrust, and if they are lucky, curiosity. 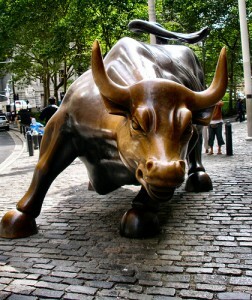 Or if they are unlucky, bold confidence in their abilities to drastically “beat the market” with their intuition. Here are three real quotes I have heard from friends over time when discussing the stock market. “I don’t know what my retirement money is in.. I just checked some boxes on the sheet when I started my job, but I don’t really understand it”. All three of these approaches are understandable, but wrong. The sentiments are valid and I’m glad that people at least have an opinion, but each represents a lack of knowledge about the statistics that run the whole system. Knowing the nature of the market is the key to being able to invest huge sums of your money over time with the absolute confidence that you’re not doing anything stupid. It’s worth gaining this confidence, because investing knowledgeably in stocks has always been the single best thing to do with your money in terms of getting lifetime income with absolutely no effort on your part. To start with the basics – What is a stock? It’s a slice of a company that you truly own. When you own a share, you have the right (but not obligation) to attend the shareholder’s meeting for that company, vote on important company decisions, and you have a right to a share of any future earnings that company makes. This share of earnings is called a Dividend. In some companies, especially smaller or younger ones, the company elects (with the permission of its shareholders) to reinvest the dividends to help the company grow its earnings even faster. In theory, this means you will get more dividends in the future. Thus, the real value behind any share in a company is the right to get a never-ending stream of dividends from it. For Example, the old, long-profitable company Lockheed Martin currently pays a 3.8 percent annual dividend while growing slowly, while Apple Computer, fancying itself a high growth company, pays zero percent right now and reinvests all profits for faster growth. Why do stocks go up and down so much? The true value of a stock is based on the amount of dividends this stock will eventually pay you, the shareholder, over time. That dividend depends entirely on how much money the company will make. But nobody actually knows in advance how much money companies will make – they just have a big host of differing opinions. Every day, millions of investors and analysts scurry around and worry about how much money each company will make in the future. “The Libyan People are Revolting! This will make the world have a shortage of oil, so prices will go up! Oil Companies are now worth more! Buy! Buy!”. “The US economy is slowing down! This means people will drive LESS to the shopping mall and buy less gas! Oil demand will go down and oil companies will make less! Sell! Sell!”. It’s a neverending din like this, for every single stock, on every single stock exchange, throughout the world. If stocks are so crazy, how can I make money off of them? Because in the LONG run, it turns out that all this speculation and volatility always cancels out to absolutely zero. The value of stocks will go up as the earnings of the underlying companies goes up. A portion of the ongoing earnings will always flow to the shareholders as dividends. And all this happens because of the natural ingenuity of hardworking humans making things at a profit, and continuing to advance our knowledge and technology and make us all more productive in every field . There may come a time when we can no longer advance, but based on the fact that we’re still driving around in gas-burning tanks and Home Depot is still doing all of its computing on green-on-black mainframe computers that kick you back to the beginning of the order if you make a typing mistake, I’d say we have at least a lifetime left to go in this department. So, stocks go up and pay dividends over time, and they have since the beginning of modern commerce. The total return has averaged a very lumpy but fairly dependable 10 percent per year before inflation, 7 percent after inflation. 5 of the 7 percent comes in the form of rising stock prices, and the other 2 comes from dividend payments directly from the company to you. When you’re in your ‘Stashing stage, you just let these dividends automatically reinvest in more stocks which creates a nice compounding effect. But WHICH stocks do I want to buy to make this free money? This is the easy part. You buy ALL of them. The world’s smartest people have done incredible studies on this for over 40 years. What they find is that the best way to make money in the stock market is to simply buy an “index fund”, which is a mutual fund that automatically buys appropriate ratios of every major stock in your country’s stock market, with no magic and guessing of which stocks are better than others. The reason the index fund wins statistically is because it can be run by a simple automated set of rules – no need to pay $350M salaries to the hotshot traders running the “Aggressive growth fund” down the street. Because there are millions of people, both smart and dumb, squabbling over the value of each stock, the Index Fund benefits and suffers from all the individual stock performances. But overall, you get the average performance of all this squabbling. If you descend into the pit and try some squabbling yourself, you may come out ahead or drastically behind the average, but as it turns out, you can’t predict in advance which squabblers (including yourself) will win and which will lose. All you can predict is that your average performance if you buy enough of these funds will be equal to the return of the market as a whole, minus the amount of fees your mutual fund charges. So by picking the index fund with the lowest fees, you automatically win. Endless statistical analysis proves this again and again. If you don’t believe me, read the book “A Random Walk Down Wall Street, or look up the topic of John Bogle / Bogleheads / and the foundation of the Vanguard company itself. But my uncle bought some stocks once and sold at a big profit! Also, if index funds really are the statistically best bet, why are there still thousands of brand-name mutual funds and hotshot traders out there? For the same reason that Las Vegas still exists and people still drive SUVs. Humans are irrational creatures and it is scientifically proven that we overestimate our own investment (and gambling) abilities, and no presentation of knowledge to the affected people can completely erase this. I have some perfectly intelligent friends who still believe they are “lucky” at games of chance, even though any scientist in the world can quickly run an experiment to irrefutably disprove the existence of any form of luck. The only tool you can truly use is statistical probability, and by buying the market average and lowering your investment costs, you are improving your statistical chances. OK, Fine. What Index fund do I want? There is one king index fund that makes the decision easy for you. The Vanguard Total Stock Market Index Exchange Traded Fund (VTI) tracks the entire US stock market index. Its expense ratio is 0.04%. This means that for every $100,000 of shares you hold, they subtract $40 per year from their gains to pay for their offices and trading costs. Some funds charge 10-20 times higher fees. So if you are looking over employer-sponsored plans, try to find a total stock index fund (or at least its close cousin the S&P 500 index fund), and compare the expense ratio to 0.04%. What is the S&P 500? This is a collection of shares in the 500 largest companies in the US, and therefore in most of the world. They are all multinational companies, so they benefit from growth around the world. If you really want to invest without having to worry, the S&P represents good odds. If you buy the stock market index of a smaller country, like Canada, you will still have good odds, but at higher volatility. (During the dot-com boom of the nineties, a company called Nortel once represented 70% of Canada’s entire stock market value. This company is now bankrupt, so you can imagine how that felt to investors solely in the Canadian index. Now Canada is the new Saudi Arabia with oil exports, so its index is again riding high on oil company stocks. I wouldn’t bet my whole Mustache on that one commodity either). What about International stocks? Some people like to get fancy and buy international index funds, which can do well when the US is hurting (as it has been recently). This is fine, as long as you understand that it’s just another form of trying to outsmart the basic stock index. When you do this, you are stating that you believe the stock markets of the other countries are more undervalued relative to future growth, than the US market is. The US is traditionally the most business-friendly country in the world, so its stock index has tended to have the highest performance, after taking into account its lower risk and volatility compared to, say, throwing all your chips onto Russia or China. It may or may not pay off in the future – I just want to point out that most people just make this decision on a whim, something like “China is so hot right now, they’re taking over the world!” . Whereas to actually justify international investing rationally you’d have to be a very sophisticated investor and truly understand WHY you are doing it. So there you have it – in two words: Vanguard.com, and VTI. In Canada, check out TD Waterhouse and their own series of funds, and let me know if you have any questions about what you find there – MMM has a Canadian Investments Expert Panel that can help us out. I love this post! I have a question though. I have an ING account and with Sharebuilder they do have that particular Index Fund you are recommending to be able to invest in. Do you recommend going to Vanguard site directly to do this kind of investing or shall I do it via ING? ING charges $4/trade if done via automatic investing. I agree with what you’ve stated, but to some it may sound too simple. I’ve gone down the day trading path, buying/selling individual stocks, pretending to know what I don’t, etc. It was great when I was in my 20s, but eventually I learned what you’ve stated here. Took me a while. I do have Vanguard Funds, purchased directly from their web site. You state the expense fee of a particular fund, but it’s also key to know that this fee is very low. This is a big deal over the long run, as you advocate. Question: I see that companies, like Google, are borrowing billions now that finance rates are low and may be going up. Because rates are so low I’m getting essentially zero percent return on my money market account. So I’m thinking, pay off the mortage instead, which carries a much higher rate than zero. Seems odd that I’d be paying down my debt while the brains at Google are taking it on. Comments? You are of course very right that there is no use having any money in a money market fund right now. If you’re feeling conservative and getting close to retirement, pay off the mortgage! If you’re feeling like going for bigger gains over a long period with higher volatility, invest all spare money in more index funds. As for Google and other young companies – think of them as young high-income people who want to be multimillionaires as soon as possible. For people in this category, it makes sense to borrow some money at a low interest rate and invest it (in Google’s case, in growing their own business). I was like Google in my 20s, but now as a ripe old 36-year-old, I feel I have enough overall savings so I wanted to have no debt at all – and thus a lower monthly expense. So I chose to pay off my mortgage instead of maximizing stock investments this year. It’s a bit counterintuitive, since I know I could get more return long-term in the stock market, but that’s kind of the definition of “conservative”. @Greg, those guys at Google are pretty damned smart, so I don’t know that I’d bet against them on the numbers. The market has yielded around 12% historically. Now, I could pay extra on my mortgage or I could invest in the market. A betting man would put 100% in the market and make 0 extra mortgage payments. A smart man would hedge and take a known 4.5% yield (mortgage interest) for a part of the money and seek a better yield on the remainder. Another thing to keep in mind is those extra mortgage payments are sunk and harder to get out of than long term cds. You either have to sell your house or take a second mortgage(pay money) to get that money back out even when rates etc. go back up. I’m not sure if you are counting this opportunity costs in your calculations. Just keep in mind, that as your approach your early retirement date, a known 4.5% yield may seem more and more attractive. I know it will be to me. That’s why I plan to have my mortgage paid off when I begin my early retirement. Hi Anita, thanks for the comment! In this case, getting a Vanguard account directly sounds like the way to go. First of all, there is no transaction fee at all, a savings which will become significant if you are making several purchases per year. Thanks again for your great life tips, financial advice, and awesome philosophies. It’s so very much appreciated. I recently became a subscriber and look forward to exploring more of your excellent website. Right now I’m invested in two mutual funds from the Royal Bank of Canada. One is a US Index Fund, 0.72% expense, and the other fund is one of these “balanced aggressive growth funds” at 2.2% expense. Vangaurd Canada offers their Total Stock Market Fund (VTSMX) on the TSX, at 0.17%, which I could buy using the RBC direct investing brokerage (or any other). Is it totally foolish to stay in the RBC US Index fund at 0.72% when I could buy into the Vangaurd Total Stock Market Fund at 0.17%? It seems to be essentially the same type of S&P benchmarked US stock fund..
Also, is this ‘aggressive balanced fund’, at a 2.2% MER, just totally a big rip off? Should I just roll it all over into the low cost ETF’s at Vangaurd, starting with the Total Stock Market fund? Thank you, and I hope it is appropriate to ask specific financial advice here on your blog. Yes! Sell those ripoff funds asap. Indexing beats active management, and fees are everything. I would add that when investing in Canada you should invest in something that is “hedged” for the exchange rate on the US dollar. That way, you’ll experience the average gains you’ve noted without potentially losing on foreign exchange. Thanks for the amazing blog. I’m reading through all the articles and getting my family involved as well. It’s made for some lively discussions. I guess we love talking about money! Do you have all of your “eggs” in “one basket”? Would some diversification not be recommended? Something like 20% per fund across 5 funds in the event of a madoff style scandal? I haven’t read the entire site, so you may have covered this already. Reading this is like a breath of fresh air! I just looked into my pension, which was setup with the help of a ‘free’ adviser. It has a fund charge of 0.3% and a management fee of 0.25% for each investment, as well as the adviser taking 0.5% per year. I assume this is a total rip off and I should dump this, move to Vanguard and save big. @Adam — MMM has it right here, but I want to offer you some numbers to flesh out his advice. I do these figures on a regular basis for my clients, so here are some ballpark numbers: assuming no current balance and investing a mere $1000 per year at 7% compound interest, a 0.17% expense ratio would cost you roughly $650 after 20 years. All else being the same, but at a 2.2% management fee, you will have paid a whopping $7,275 in management fees–that’s more than an 11 times as much. Keep in mind that if you have an existing balance or are contributing more than that (as you should be!) the difference in these figures will actually widen due to compounding of interest. As a general rule, you shouldn’t exceed 0.50% in the expenses and fees of any fund, and lower is almost always better. Vanguard is just simply the best. Read about Vanguard and its founder’s (John C. Bogle) simple investment philosophy. Very low-cost investing. You never need a broker. Simply the best. Thanks for this updated reply. I’m very new to this investing universe and was very excited to see a simple option to at least get my feet wet. MMM — you might enjoy this YouTube Video of an interview with Jack Bogle. Two great lessons… one about investing in index funds and another about having Enough. He kind of made me teary eyed at the end there, actually. P.S. Warren Buffet has also been quoted many times advising folks to purchase index funds. Surely these 2 wise worldly men can’t be wrong. Thanks Mrs. M.. that is an excellent little video. And Jack(John) Bogle seems like an excellent Senior Mustachian – I’m going to have to read this “Enough” book of his since it sounds like exactly my own philosophy. It is also nice to hear that Mr. Buffett agrees with me on the Index Funds, even while he is one of the very very few people in the world who has consistently beaten the index with his Berkshire Hathaway investments.
. Text seems to imply that all profitable public companies pay dividends, but many choose not to pay dividends. Yes, those are valid points – the expense ratio applies every year, but it is true for all mutual funds so the key to maximizing profit still lies in comparing and minimizing these expense ratios. And I did try to address the different dividend strategies in the “what is a stock” paragraph, but maybe it was not clear. The fundamental thing is that, if a company is not paying dividends, they’d better be planning to reinvest the profits for growth eventually. Otherwise they would be a profit-making, non-growing, non-dividend paying company. The company will just build up an infinitely large cash hoard, which does not benefit shareholders. At this point, the shareholders would get antsy and vote to have the money distributed to them as dividends. A good example of a non-growing company is my own utility company, Xcel Energy (ticker symbol XEL). Its dividend is a very high 4.12% because it can’t make more money by investing profits – it has a fixed customer base and regulated electric rates. If you buy this stock during a market crash so the stock price is lower but the earnings are the same, your effective dividend rate is actually over 6% – quite a nice semi-guaranteed stream of low-tax dough! 1) How easy is it for me (or other people not in the US) to buy that index fund? 2) What about the currency risk? The Euro is still strong against the dollar, and of course this changes over time, so wouldn’t this affect the investment in unforeseeable ways? Good question, although I do not know much at all about investment from a European perspective. I’m only familiar with my own countries so far, Canada and the US. Maybe another European is reading who can speak up on their investment perspectives for US and world stocks. Also, you are right that fluctuations between currencies will add an extra variable to international investments. Even here in the US this is true – I do have some international index funds and they are showing great gains right now since they are expressed in US dollars, while the other currencies have appreciated relative to us. If the Euro is strong now relative to US, it could be a good time to buy US stocks if you believe the US dollar will recover eventually. you’re pointing to an american fund with european stocks in it, while Marcel and MMM were talking about investing as a european (i.e. you live in Europe and you want to buy cheap index funds). I started reading your blog from the beginning after reading through the most popular articles upon finding it a couple of weeks ago. I find this topic still interesting because I am in a similar situation as Marcel. Are there any new resources in the last 5 years where I could read upon this topic? I am in the same situation. After some research, I found IUSE, https://www.ishares.com/uk/individual/en/products/251903/ishares-sp-500-eur-hedged-ucits-etf. I think that is what you are looking for. I know Marcel’s original question was posted years ago in 2011. I am wondering if anyone can share any experiences regarding investing in Index Funds outside of US since then? I am in a similar situation as Marcel: I am from Austria living in Spain. I am researching the Vanguard platform but it is not ideal if you are not based in US and don’t trade in USD. An alternative I am trying right now is https://etfmatic.com which was founded in UK and is also available in Europe. I can share my experiences later. I’d appreciate any input or experiences others had. I for instance live in Germany and have yet to find a suitable Option yet, so i’d be very curious to see what your experience with etfmatic was. I have quite a bit of cash sitting around earning nothing in savings accts and money market accts. Some of the money needs to stay accessible for college tuition and the rest will probably go towards paying cash for a home. Would you recommend using an index fund in this situation, or should I just grin and bear the lack of any income from the cash? If you are feeling very adventurous (and are prepared for the possibility that the value of the investment may go down before it goes up), you can still go for the index fund. Gambling can be fun when the odds are in your favor. For less volatility, check out Vanguard’s VBINX fund – a mix of stocks and bonds. When the stocks go down, the bonds go up, so the fund is more stable. To be honest, I don’t currently know anywhere to get a guaranteed return of more than 1% for only a year or two. It sounds like you’ll do well either way though – congrats on the upcoming debt-free adulthood! First, it’s never a good idea to gamble in the market with money you need in the short term. The reason is because losses get magnified. Three years after the low in 2009 you are just getting back to your money. Think of it this way, you put $100K into the market and it drops 35%, so now you have $65K. If the market now goes up 35% the next year, you don’t go back to $100K, you instead gain 35% of your remaining $65K, or $22,750 for a total of $87,750. The market would have to go up 54% for you to get back to your original $100K. So typically if the market takes a loss which occurs on average, but not predicably, one out of every four years, you can easily end up losing money. That is why most financial advisors typically recommend any money you need in the next 5 years or so not be in the market. Thank you for your many replies Mr. MM – I hope I haven’t been too much of a pest. I started at the beginning of your blog and worked my way forward, such wonderful information you have offered. Thank you! I might be missing something. But why don’t you invest in an S&P 500 ETF, like VOO, instead of the mutual fund? The expense ratio is far less in the ETF. BTW, you have a great website. Your articles are all well written. Good point – looking it up, the VOO index tracker has an expense ratio of 0.06%, while VFINX has a ratio of 0.17%. For each $1,000 you have invested, this makes a difference of $1.10 per year. For a buy-and-hold investor, the VOO could save some money. But to buy an ETF, you usually need a brokerage account. If you are making monthly or bi-weekly investments to an from your paycheck, your trading costs might add up to much more than that: 26 paycheck-deduction-style purchases at $5 each would run you an extra $130 per year. Also, once your account in VFINX gets up to $10,000, the shares automatically convert to Vanguard’s Admiral version of the same fund, which has the symbol VFIAX. The expense ratio of the Admiral shares is only 0.06%! thanks for joining the blog! I’m very new to your website and I want to learn all about investing in VTI. Do you have a tutorial on how to invest in index funds(step by step process). Do you invest on a monthly basis? Perhaps you can direct me to a section in your blog that talks about this? Thank you and I really appreciate what you’re doing! If you have a brokerage account with Vanguard you can trade their ETFs commission free. I believe the major differences between ETFs and Mutual funds are bid/ask vs. NAV and capital gains deferral. With your VFINX fund, how much capital gains do you have to pay taxes on annually? I’ve been reading through from your first post over the last few weeks, and have you thought about linking this page to Getting Started #1? When I read that, I couldn’t figure out your love for the VFINX without doing more research. I think this would really help beginning readers like myself. First off, I recently discovered this blog and now I am consumed by it. Your perspective and attitude is exactly aligned with mine, and your style is much more entertaining to read than many other financial blogs. Ok, enough with the compliments. I am living in Toronto and I have researched Vanguard up here and it doesn’t look like they have much of a presence yet, though they have announced they are expanding into Canada. I also looked into TD and have noticed they have a new e-Series fund account that significantly lowers the management fees on index fund purchases. Does your expert panel have any tips for how to best direct your investment dollars in Canada? Good advice to begin with. However it is important to also consider further diversification, by different asset classes and geographical areas (property, REITs, bonds, international stocks and emerging markets etc). This may seem to make things more complex, but I’m sure Vanguard has funds in the US which have this sort of diversification already built in. I would like to recommend Bill Bernstein’s books such as The Four Pillars of Investing and The Investor’s Manifesto which cover this subject very well for US investors. Had I read these books 10 years ago and diversified accordingly, I would have benefited from the extra diversification in bonds and emerging markets, while my home market failed to make any significant progress over the decade. Ah the expense ratio explains why you push the Vanguard fund so much. Others I’ve looked at were around 1%. I am still in the early 20s gambling on the stock market stage, but trying to push myself to think longer term about where I put my money. Maybe you have some thoughts about an issue I have with most index funds: they consist of stocks in big companies. This is good for dividends, but I see it as a problem — I cannot morally bring myself to invest in many of these companies. Looking at the top 10 holdings for a few index funds, I see stocks like Exxon-Mobil, Microsoft, Phillip Morris, Apple — companies that individually I would not invest in on principle. For this reason I’ve been considering a small-cap index fund. But I was dumbstruck by this fund’s top-ten companies. Although the first two on the list are known for walking the “corporate social responsibility” (CSR) talk, the others include four mega-banks that had a hand in the subprime mortgage crisis. Then there are the companies that may be known for CSR but that I would not want to support, such as the world’s second-biggest manufacturer and peddler of soft drinks. I looked at the full list of companies and found a mix that I would say Yes, Maybe, and No to individually, but No to altogether, especially with 25% in financials and 22% in health care, two industries whose biggest entities are the height of avarice and whose top-dogs are paid staggeringly huge salaries and bonuses (hundreds of millions of dollars per year) that I believe come from entrenched practices of outright usury and gross overcharging, among other heinous activities. I wonder how the choice of these companies for this fund can be justified with anything other than spin, though I am open to others’ viewpoints on this. This fund also rates as higher-risk and comes with a charge of .29%. In my little way, I strive to Be Good and Do Good, and I don’t like talking out of both sides of my mouth (or mustache?) – avoiding these companies in my day-to-day life while my bottom line profited from the wrong I believe they do others – I don’t want to do that. Of course I am free to do whatever I wish with my money, and when I search for an index fund made up of, say, credit unions, non-profit clinics, Ben & Jerry’s and peace & love, I’ll probably find a Do Good Fund in Mother Jones magazine, and I won’t dwell on this fund. MMM, what’s your take on this – either this fund or the one you have your money in, or investing ethics in general? (So sorry if you addressed this in another post; I have not read every single one!) I’m not complaining idly – I’m curious what you think. I was going to leave a very similar comment, but you beat me to it. I don’t put my money in a BoA account out of principle, so why would I want to hold their stock? http://en.wikipedia.org/wiki/Socially_responsible_investing has a list of funds. MMM, I’d love to hear your take on this! I’m in the same boat as you guys–didn’t expect to see these comments and was relieved to know I’m not the only one. I don’t want to support companies that are harming people or promoting what I would consider evil in the world. I’d like to second (fifth?) these questions – MMM, do you have any advice on growing one’s ‘stash while toeing the socially responsible investing line? In particular, I want to keep my my money out of fossil fuel companies’ pockets! The thing is, their criteria for good/bad might be different from your own. But it could still be an improvement over owning ALL shares. Vanguard’s VFTSX fund is indexed to the FTSE4Good index, so holdings are decided at a national and multi-national level. I definitely agree that the FTSE4Good’s holdings OFTEN do not reflect the values of many socially responsible investors and good on you for digging into it. I still have Vanguard’s socially-responsible indexed fund, as well as some small-cap and real estate funds. (Commercial real estate is trending very strongly toward energy efficiency and sustainability so I feel good about this). If I were less concerned about return (or had more capital to play with) I would definitely absolutely no-question purchase Calvert funds. Calvert provides carefully vetted funds that are not dependent on DJSI, FTSE or other indices. You can select funds based on different moral priorities. For example, I’d like to invest, not only in small-cap, but in small-cap renewable energy. If you search for Vanguard they have some funds that are industry specific and fossil fuel free: Technology, Real Estate, and Health Care. Unfortunately, Vanguard’s Social Index has investments in the fossil fuel industry. Great blog MMM, I stumbled upon it a few days ago and have been entranced reading all your entries. This one has made me think about my own investment strategy and come out of the shadows to actually posit a question. So, I was literally grandfathered in to a Fidelity account, my grandfather set it up for me back when I was in high school, and have thought I was being wise by investing in FSTMX in it. I loved it’s .10% expense ratio but now that I see that VFIAX has 0.06 I am tempted to move my money there (I have over 10K in my IRA so it’d all be VFIAX right?). My other thought though is I’ve been reading some other stuff that says it is better to buy an index fund that weights on dividends paid rather than company value. I could also go for a Dogs of the Dow type strategy like they mentioned over at ERE. What do you think? Hi there MMM! I’m valiantly trying to sprout a ‘stache and I think I spot a few whiskers, but I’d like your advice on how to keep it properly groomed. Currently I have a 401K with my employer, and I’m pretty happy with the results. Even though I have student loans I’m investing 5% (my employer matches fully 3% and then half up to 5%). Your insistence that the Vanguard Index Fund is the way to go has me looking over my portfolio. You can probably guess that I fall into the “I checked some boxes when I was hired, but would like to learn more” category. Please help me get a handle on this. Currently my portfolio is diversified between Stock, Bond, Blended, and Income investments. Vanguard Index is available, with an expense ratio of 0.06%, but currently I’m invested in a Mainstay Large Cap with a 0.94% expense ratio (ouch?). It would appear that even with the higher expense ratio, the Mainstay comes out more profitable in the long run. What are your opinions? Is there something I’m not taking into consideration? In general and statistically speaking, funds with higher expense ratios like that Mainstay one will lag a low-cost index fund. If you happened to beat the market over a random time period, consider yourself lucky! But the odds are in your favor switching to an equivalent fund with lower expense ratio at any convenient point. I am a new reader of your blog from the Netherlands. Slowly on my way to be a Mustachian maybe, by getting the mortgage paid off and figuring out what is was again we are earning money for. Anyway, I have invested in Index funds in the past, but have sold it all recently. Even if the cost is low, it is still a Bank Product, so you are paying your bank money for something you can easily do yourself. Just find out what stocks are in your index, at which ratio, and make your own little basket of stocks. It is true that the basis for buying should not be to outsmart the market, but just follow the index. As for combining indexes, American and European for example, this is in itself not a bad thing, if done out of risk-spreading motivation, instead of the outsmarting motivation. Greetings, and looking forward to reading more of your blog! Hi Hanne, thanks for joining in! I’m not sure about the availability of index funds for Netherlands investors, but in general your costs are much lower buying low-cost passively managed funds compared to trying to mirror the share ownership pattern yourself. An index fund does tens or hundreds of small transactions per year in its job of tracking the index, but it gets those transactions almost free on a cost-per-shareholder basis. As an individual investor, you have to pay several dollars per trade. It all depends on the expense ratio of your fund – you can do your own math, but the US company Vanguard offers expense ratios often below 0.1% per year. In other countries, this cost is sometimes more than ten times higher, which would change the calculations somewhat. Finally, holding your own stocks can still be valuable for other reasons. If it motivates you to learn more about business, finance, and investing in general, the benefits might outweigh your trading costs. – 0,1% is very cheap, this is true. My Index fund was 0,5% plus a fee for every transaction (same as when buying straight stocks). As for the hundreds of small transactions necessary to track the index, you don’t really need to do that to mirror the index yourself. Following the index 90% is just as good as following it 100%. – I don’t know much about the index fund you are recommending, but I read an article about Dutch Index funds that there are often hidden costs, by for example hidden in the restriction on real time trading. MMM, living on a small island in Asia I am very jealous of the investment options available in North America. It is not possible for us non US residents to invest directly in US mutual funds – we can only invest in ETFs and there are very few US brokers who are willing to take on international clients (generally only the most expensive ones). US brokers have to deduct a flat 30% non resident tax on most dividends. Boooooo. And finally there are no 401(K) style retirement accounts. Having said that there is no local tax (yet) on overseas income including those ETFs and we get amazing national health care for around US$50/month depending on income. Another good book on investing with this “mustachian” style is “How a Second Grader Beats Wall Street” by Allen Roth. It is worth your time to look it up the next time you bike down to the Library. I am 20 and I am in college studying mechanical engineering. I would like to start investing but I don’t have much to work with currently. Your recommendation to buy from Vanguard requires a minimum of $3000 to get started. Do you have any cheaper recommendations? I have a similar question- $3000 to get started is a big investment for me at this point. Did you find anything that fit your needs better? When my son was 8 we bought his first stock. I let him choose. I figured he’d pick McDonalds or Toys R Us or some other kid friendly company. He chose Nike. That one share did so well that I signed up for their DRIP. When we first started buying it was at around $80 a share. Now it’s at $97!!! It’s still my (his) best performing investment! I’m glad someone mentioned the DRIPping strategy on here! MMM alluded to it in talking about automatically investing dividends and in turn automatically buying more shares. For Canadians out there I would recommend Derek Foster’s book “The Lazy Investor” which is more or less about retiring through DRIP’s in stable companies that have a long history of paying dividends that increase every year. I have quite a bit invested in TransAlta right now, and even though their share price has dropped quite a bit recently they still have a healthy history of dividend payments. This means as long as the dividend stays the same, and the share prices go down, my dividends will only buy more shares. For this to work well I need TransAlta to eventually recover but based on their history, and industry (utilities) I believe they will. Just getting acquainted with your blog and LOVING IT! Have been fairly frugal all my life but see lots of areas of improvement and can’t wait to start really growing my stach! Wondering if you have a current suggestion for investing in Canada. My wife and I are finally in a position (out of debt!) where we are actually managing to save money (!?!?!?!) but I have no idea where best to put it these days. p.s. we (I now know) stupidly bought a new car about a year ago – any suggestions about how to dig out of that mess? Or should we just stick with it? I suspect that in most cases, the investment is in an ETF rather than Vanguard funds, so you will need a broker. Go to the link above, click on your area (Australia covers New Zealand as well by the way), and view their list of ETFs. Take note of the stock exchange code, and call your broker to invest. Some caution is required with ETFs when purchasing. ETFs tracks the index very closely, but a wide bid-ask spread or deviations from fair value might make ordering “at market value” a bit risky – you could end up buying/selling your shares at a much higher/lower price than you expect. So always make sure you set a limit order. This ensures you purchase your ETF shares at a set price or better (not worse). Brokerage accounts – if you don’t have one, shop around and read reviews about the various companies. You want to ensure that the broker only charges a minimal trading fee per stock purchase/sale, and doesn’t charge a flat admin fee across your entire portfolio. You don’t want to pay someone 0.5% every year for holding stock certificates for you. Thanks for the tips, Linda! Looks like we’ll be using their Hong Kong office later this year. I live in Ireland and here ETFs are taxed differently to company shares and the same as life assurance company investment funds. The growth is taxed at 41%, with dividends being considered growth. Any gains when selling are also growth, and every 8 years tax is paid on the growth. Not very good for someone who wants to live on the dividends, and can be a lot of work keeping on top of the correct amounts of tax to pay. Holding shares in individual companies is a lot more tax efficient. Dividends are taxed as income, so you can pay less tax if you don’t earn so much, and gains are only taxed when you sell. It all makes index investing difficult and less tax advantageous. Thank you, Senor ‘Stach! I thought I was doing well with my Fidelity Freedom Fund, until I checked the expense ratio. Turns out I was just getting S&P 500 performance with a 0.62% expense ratio. I moved to a Vanguard S&P 500 and a Vanguard bond index in the same percentages as the Freedom, but with 0.02% and 0.07% expense ratios. Nothing like saving $350/year with a few mouse clicks! This article is very helpful, but I have a couple (maybe obvious) questions- If I live in Canada, can I still purchase Vanguard funds? Also, you mentioned TD Waterhouse funds- I am currently with RBC. Is there any particular reason why TD is better or why I should switch? Vanguard is in Canada as of November 2011 so you can buy them yourself through your own online discount brokerage account: http://www.vanguardcanada.ca/individual/portal.htm. I have most of my funds in the full index at Vanguard, can you explain why you go with the S&P 500 index instead? I’d be fine with either, but I’d like to hear your thoughts on limiting it to the S&P 500. I thought you covered it somewhere at some point, but can’t find it right now. Also, any bonds in your portfolio right now? I’m thinking of dumping bonds for stock index over the next few months. I would also like to know why you are suggesting VFINX over the total stock market index fund. Thanks! Good point Seth – I changed the article to suggest the full stock index instead. Originally I had Vanguard’s VFINX, because more company 401(k) plans seem to have S&P500 funds than have total stock index funds. And the performance is pretty correlated since there is lots of overlap in the holdings. But if you can get it, get the VTSMX/VTSAX instead to get the whole picture (which in this case means owning smaller companies as well as the biggest 500). Great post! A lot of what you said I learned from “Boglehead’s Guide to Investing”, which I thought was a great read. Happy to see you have put the same premises to practice and have been rewarded from it. Found your site recently, so I am still going through the posts. As I understand it, both Mutual Funds and ETFs are traded for free through a Vanguard brokerage account, correct? So I would be safe having my savings installed on a weekly (automated) basis? I live in Canada. I invested RRSP money in some mutual funds through Bank of Montreal. I had a look at TD Waterhouse like you mentioned, and I can now see that BOM charges quite a lot in fees. I would like to transfer the money out of there and buy TD Waterhouse US Index funds. Is this an easy thing to do? Thanks for any advice on this! It is indeed probably pretty easy. I still have an old RRSP in Canada, and I transferred it out of a fee-laden Scotia Mcleod management to a better financial services co. managed by a friend of mine. You can probably find instructions on the TD site to initiate a transfer.. often the destination company will do all the work for you, since they are excited to get to manage your money. I might add that your bank surely has a stock brokerage division so that you can set up a brokerage account for your RRSP or non-RRSP investments, have them transfer in the money (you just need a current statement from the source company if it’s not the same bank) and then manage it yourself by buying whatever index fund or ETF you like. I’m with Scotiabank, and have Scotia McLeod discount brokerage accounts so that I pay $9.99 per trade. All are accessible from my online banking portal. Although you can’t set up an automatic investment, reinvestment scheme, you can have your bank automatically transfer in cash on a regular basis to “pay yourself first” and then you can buy more units of your fund or ETF at regular intervals when your cash reaches a certain level. I am only 14 years old, but I would like to start investing in the stock market. I am new to your blog, but I appreciate how easy it is to understand. However, I really know nothing about stocks, so I was having some trouble understanding this post. Could you recommend where I should start for a simple way to invest in the stock market? How can I tell if Vanguard a good option for me? I know you might not have time to respond to this comment, but I would really appreciate if you would. Just started to follow your blog last week and I have just started investing on the VTSMX index fund today. One of the other Vanguard funds that I’m planning on investing on is VGSIX which is purely a real estate index fund, do you have any thoughts on this fund? Appreciate your inputs. Great blog by the way! Thanks for the blog. Enjoying it tremendously. What is your opinion on socially conscious funds? Of course, they decide what is socially conscious and can’t take everything into account. But they do not support blatant human rights violators (like Apple, Chevron, Coca-Cola, to name a few). The goal of Mustachianism seems “make money to improve personal quality of life”, but could it also be to “make (possibly less) money to improve others’ quality of life”? Or have you just not found a socially responsible investment group that you can get behind? Thanks! 2) Real Estate Investment Trusts – professionally, I know that the commercial real estate market is demanding energy efficiency and sustainability, so competitive real estate companies are investing in reducing the environmental impact of their buildings. 3) I invest in Vanugard’s fund that’s indexed to the FTSE4Good index. This isn’t the greatest, as many mega-banks and other companies that might not fit SRI values are held by this fund. If I was willing to take a smaller return, or had more capital to invest, I would definitely consider Calvert funds. I admire this company greatly. They actively manage for a variety of investor priorities (instead of indexing). The costs are higher (because: no indexing) but you will have much more control over where your money goes. Calvert also occasionally gets involved in shareholder actions that attempt to influence corporate behavior for the better, and research on SRI. I also encourage you to look at Interfaith Center on Corporate Responsibility (http://www.iccr.org/) to see how individual companies respond to shareholder actions. I really appreciate your blog. Your frugal approach is very similar to mine, although I’m still a long way off from retirement. My wife and I have one old Honda Civic between us, buy pretty much everything used, and share our house with four tenants. My biggest stumbling block is this: I have a pretty strong aversion to supporting many of the corporations that would be in an index fund. I know that there are decent individual corporations out there I could invest in, but buying individual stocks seems risky. I also have looked at a bunch of socially responsible mutual funds, but they seem to yield really low rates. It’s for this reason that I’ve avoided the stock market so far. I’ve instead used my savings to pay down debt. At this point all I’ve got left is student loan debt at 3% interest and a 15 year mortgage at 2.625%. Since both of those are below historic inflation rates, I feel like sinking money into repaying them early probably doesn’t make sense. So, any advice? Do I bite the bullet and accept that managing my money for retirement will require me to go against my values and get an 401k index fund? Do I just try to create a balanced mix of investments I feel better about (rental properties, stocks from “good” companies, peer-to-peer lending, credit union CDs, TIPS, etc)? Is there another way? Thank you for any advice! Hi there – take a look at my response to Alyson’s similar question (above, 4/30/13). I outlined what I did with my small portfolio, and what I would do with a larger. I like your suggestions about peer-to-peer lending. In many states, individual investors can also get involved in solar lending and energy efficiency lending for community projects. These have a smaller but consistent return. A well balanced WORLD FUND (being roughly 60% US companies) by market capitalisation as you suggest is the only sensible solution. There’s a world of difference between trying to pick individual stocks within a single economy (your point #1) and picking individual economies within the global economy (your point #2). Broadly, those companies within a single economy play under the same rules/law (emphasis on broadly, i know there are companies that get special favors, etc) and thus their performance is based mostly on the people at those companies outhustling, outsmarting or outinventing their peers in order to perform better. The average investor is going to have no idea which companies to back in a single economy, so it makes sense to back them all and diversify. However, it is not hard to see which individual economies are smarter to invest in over time. As MMM mentioned, the US has historically had better returns than the rest of the world. There’s a reason that Saudi royals, Russian oligarchs and others rush to US property and markets whenever their economies get the smallest hint of instability. I don’t think it’s a bad idea to invest in a World fund, especially one that weights companies by Market Cap as mentioned, but MMM suggested understanding why you want international stocks before investing in them. I don’t think that is a contradiction with “don’t try to pick stocks”. So this is great and you’ve pretty much singlehandedly persuaded me to heavily consider putting my savings into an index fund. However, being the kind of person I am, I like to aim to be prepared for the absolute worst case scenario as much as possible. In this case, it would be something like the Great Depression, where the Dow Jones Index lost 90% of its value. So there’s a boom and a bust and a boom again, but I think that is most certainly an oversimplification and doesn’t at all explain the underlying causes – only the trend. What happens when the bust is particularly traumatic? Do you have a backup cash reserve, or something similar? How would you fare if 90% of the money you currently have invested in stocks dissipated over the next two years? Just curious what your course of action would be in this extreme hypothetical (though at one point very real) scenario. – be willing to adjust spending downwards if the need ever arose (at least half of my own family’s current $25k annual spending is on purely optional luxury stuff – we could get by on $12k). – realize that you might end up earning money after retirement (we earned over $75k in each of the past two years, even without formal jobs, saving all but the aforementioned $25k of it). – own assets other than stocks (I have rental real estate, REITs, international stocks, Lending Club notes, and other stuff). – be sociable and active after retirement so you build up more friendships (I am lucky enough now to know quite a few people who own or work in companies that are always looking for workers). I am a bit shocked about some of the international users commenting here, especially their willingness to invest in a US S&P500 fund. I also ask myself, what if the MMM family eventually wants to retire in the mountains of BC, on the range in Saskatchewan or (in case you really hate to meet people) north of Algonquin Park, in short: in Canada? For instance, when my then girlfriend, now wife did an exchange year in Canada in 1998/1999 we could go to Tim Hortons and Harvey’s often – it was cheap in US$. If we’d go now, we’d pay more than 1.5x as much just by changes in the US$/CAD$ exchange rate. You’d also look at a bleak picture if you invested in the S&P500 with Canadian $ in that period, even with the 47% gain in the S&P500 (Aug. 1998 till now). The CAD gained ~52% compared to the US$ in the same period, wiping out all the S&P500 gains and then some. The same goes for the ‘retire-in-Canada’ idea, if you just held all your money in Canadian bank account (no gains!) you would have done better than investing in the S&P500 – in a 15 year period. So, Mr. Money Mustache, any good strategies to prevent this Ups-we-get-poorer-compared-to-the-rest-of-the-world-because-we-have-US-dollars syndrome? Love the advise! I’m wanting to get my green employees working for me too but I’m confused – you say to invest in index fund like Vanguard Total Stock Market Index Fund but seems like it’s a mutual fund? SPY would be a index fund. From what I read, ETF, Index Fund, and mutual fund are all different type of investments. I have been looking all over in comments and the investor alley and seems like no one ever has TD Ameritrade accounts for some reason… or no one says they have TD Ameritrade. I have a taxable account and a Roth at TD Ameritrade. To save time and the hassel of moving to Vanguard (but may be i have too?). I was thinking to just invest what you suggest but a equivalent one at Ameritrade. I’ve think VTI may be an equivalent one to VTSMX but I’m not sure because of the confusion between mutual fund or index fund, I haven’t been able to commit since both investment vehicles have pros and cons. VTI on the list of “100 Commission free ETF” from Ameritrade. TD ameritrade has only transaction cost of $9.99 and no cost for DRIP. Is there any downside to not moving to Vanguard? Hey Mr. MM, great blog! Question: Have you heard of or thought about Betterment.com? It’s worth the look, but it’s a really young company as far as I know. Still, it looks pretty good. I really enjoy your blog, thank you for enriching us. One tip that I would have would be to make it more accessible for non US readers, such as Germans, like myself. For instance, do you know if this Vanguard Index exists in Europe? Hi Vera, I know that I’m late to address your question, but here I go: I actually wrote to Vanguard Germany, and got a reply from the UK. They seem to be interested only if you’re about to invest in the hundreds of thousands of Euros at once, so they’re not really “in the German market”. If you’re willing to exchange ideas for German mustachians, please reply to this post. As a German, if you want very low transaction fees you can open a brokerage account at Interactive Brokers UK (min. $10K deposit required or $3K for young people) linked to your primary German bank account. That way you will pay a 0.1% transaction fee instead of ING DiBa’s usual 0.25% for stocks and ETFs (note there is a new accumulating iShares ETF for S&P500 with a 0.07% total expense ratio since this year). Through IB you will also get access to low overnight margin rates for borrowing funds (currently 1.59%), by which you can double up your investments. Obviously this will double up your losses, too, and interest rates are going to change in the future. However, IB will charge you a monthly minimum activity fee of $10 – commissions paid during the month unless your balance is over $100K, so it may not be worth it if have no assets and you only buy small quantities irregularly. Note that deposits at IB are insured through SIPC up to $500K ($250K cash), so maybe don’t put your whole fortune in there. Ray, thanks for the information! Interesting tradeoff with the minimum activity fee instead of higher transaction fees. I will look into that, though without margin trading for now. also from Germany and interested in sharing ideas! My Broker set up my Roth with Franklin Templeton. After reading this blog I am beginning to believe that my cost are too high. What do you think? Yeah.. according to the indexing philosophy that I subscribe to (also known as the Bogle/Vanguard way), any expense ratio above about 0.25% (and any sales charge above 0.00%) is not worth paying. My own funds are mostly below 0.15%, and US domestic funds are even better: Vanguard’s VTSAX has an expense ratio of 0.05%. This is 95% lower than the typical fee of funds with similar holdings! You can find Vanguard equivalents of all the categories you listed above. I just hope you haven’t already been dinged with sales charges (aka front-end loads). Yes.. Templeton took 5.75% off the top of my original deposit and they they take 5.75% of my monthly deposits. I guess I need to close these accounts out and transfer the $ to some vanguard index funds. Is it possible to buy index fund from USA even though I live here? Just trying to clarify, Mr. Money Mustache…. Do you invest in Vanguard’s Total International Stock Index Fund at all? or do you solely invest in Vanguard’s Total Stock Market Index Fund? Good question – these days I do both with equal priority, partly because of different market conditions today than when this article was written, and partly because I’ve had time to read a few more books. Probably time to update this article, eh? Hi MMM. I would love for you to update this article! I have referred to it many times since I’m only in the beginning of my financial independence journey. This takes all of the guess work out of picking individual stocks while “beating” the market consistenly. Of course, it would be easier to use the vanguard but who doesn’t like higher returns? Thanks for all you do MMM!!! Probably this has been mentioned somewhere already, but just a note regarding Vanguard VTSMX. Investors are eligible for the ‘Admiral’ class of funds if a $10,000 balance is attained. These Admiral class shares run a lower expense ratio than the standard ‘Investor’ class shares. The Admiral class equivalent to VTSMX is VTSAX, which runs a 0.05% expense rather than the 0.17%. Thanks for all the info MMM. Thanks for such a clear and concise outline of investing and access to the stock market. My only hesitation in moving forward with this is that I am conflicted with the ethical implications of the investments. Of the largest holdings, (14.2% of assets), Chevron and Exxon on are the top 10 list. Regardless of political leanings, both gas companies are responsible for a massive contribution to increase in fossil fuel usage and, by extension, rapidly increasing climate change. General Electric is #5. In 2005, General Electric was the 12th largest contractor for weapons manufacturing for the department of defense. I have very little respect for Wells Fargo’s (#8) part in the 2008 lending crisis and targeted predatory loans. I have a good amount of capital just sitting in a low appreciation savings account for just these reasons. I would like to know more about investing without compromising my values. I would guess based on your commitment to ending poverty that these issues must matter to you. Any thoughts on this? You’ll want to do more research, but there are Green Funds available for the ethical investor. It’s a fund made up of only socially/ethically/environmentally responsible companies. Here’s an intro article. When will phase two of Canadian Investing with Mr. Frugal Toque be gracing these pages? Before the snow please?? Hi MMM, I’m working my way through all of your blog posts and am enjoying myself immensely while doing so! One quick question: My husband has recently closed out a really poor performing, high fee account with American Funds. We are sitting on a check for about $13K. I’m fairly certain we’d like to park this in the Vanguard VTSAX fund. I’m wondering about something I read (can’t remember where– perhaps the bogleheads site?) on the interwebs that mentioned a $250 annual fee for having an account with Vanguard. Is this true or merely a vicious rumor? Also, how would one get the physical checks to the Vanguard folks if they’re made out in my husband’s name? Our 90 day window is ticking down, so I’d love to have this taken care of sooner rather than later. Thanks, MMM! You ROCK! No annual fee. And you could always open your Vanguard account in his name, or as a joint account (?). Is it okay to deposit the checks in our checking account (since they’re made out to him) and then do an electronic funds transfer to Vanguard as long as it’s within the 90 day window? Just don’t want to get dinged on penalties. Oh… one other question. If the old account was a Roth and the new account is a Roth there shouldn’t be any tax consequences, right? Diane, I would NOT cash that check. That would likely then be considered a distribution. You probably would not ultimately have to pay taxes or a penalty on that, but you would have a lot of explaining to do through multiple forms, etc. That is a hassle that you should try to avoid. Either deposit the check directly with your new broker in your new account, or try to get the old broker to write a new check directly to the new broker. I believe you have only 60 days to do something with that check. Someone please correct me if I have that wrong. Most sites writing on index investing would recommend that beginner investors buy into index funds that follows their home country’s index (minimizes currency risk). Would you recommend that (international) investors look into buying the VTI as part of their portfolio as well? Hi MMM, I have a question regarding dividend returns. Elsewhere on your site you talk about shooting for an average 5% return on your stash but in this article you talk about placing all money in VTSMX which currently returns around 1.7%? I’m not sure if I’m misunderstanding something, but I was hoping you can elaborate on how you think VTSMX should fit in a broader portfolio to get closer to the 5% target? What is your take on the IYY stock? Which to my understanding is similar to your VTSMX but is a stock instead of a mutual fund. Can you explain the difference? Drawbacks? Benefits? Here’s my first comment after finding this website. First off: LOVE your blog / life story MMM! For all the European readers (I’m from The Netherlands myself). I invest in a EUR hedged MSCI tracker myself. (iShares MSCI World EUR Hedged, ticker IWDE). The TER (costs) is not extremely low at 0,5%, but acceptable for me. If other readers have a better tracker, please do share! Loved reading this article on investing. I read Smarter Investing by Tim Hale a while ago and that got me into tracker funds. Set it and forget it! Thanks for all the good advice!